Our villa is located a few steps from the sea and a beach so reserved to make it look almost private. The villa is divided into two apartments, one named SOLE, offering 4 beds located in 2 separate bedrooms and one LUNA name offering 5 beds. The apartments are about 50 square meters each, they are neighboring but completely separated and independent from each other. The apartment enjoys all the amenities shown on the site. The SOLE apartment has 4 beds located in two rooms, a double bedroom and a bedroom with bunk beds (2 singles). There is a bathroom with shower and a kitchen equipped with every accessory. The large terrace with sea view is its strength. Superb location. Have been there for a second time as I like the place so much. "Our family (2 adults, 2 children) had a very pleasant stay at this property in mid July. It is a nice little apartment/house with a big sunny veranda which has a great view of the sea (we stayed in the the ''Sun'' the other property ''Moon'' has a smaller veranda which is mostly in the shade). As the photos show the property is a few yards from probably the best part of a sand/pebble beach. The beach is lovely and quiet so it feels like a private beach (probably due to the fact that there is only residence parking)which is a great asset. The owner was very helpful and was often around if we had any problems he even came to meet us in Sciacca to guide us to the property. It would have been nice if there was a map of the area and a few other bits of local information in the apartment but that is just a nice to have and not a negative comment on the property or the owner. We had a great holiday and would recommend the property." 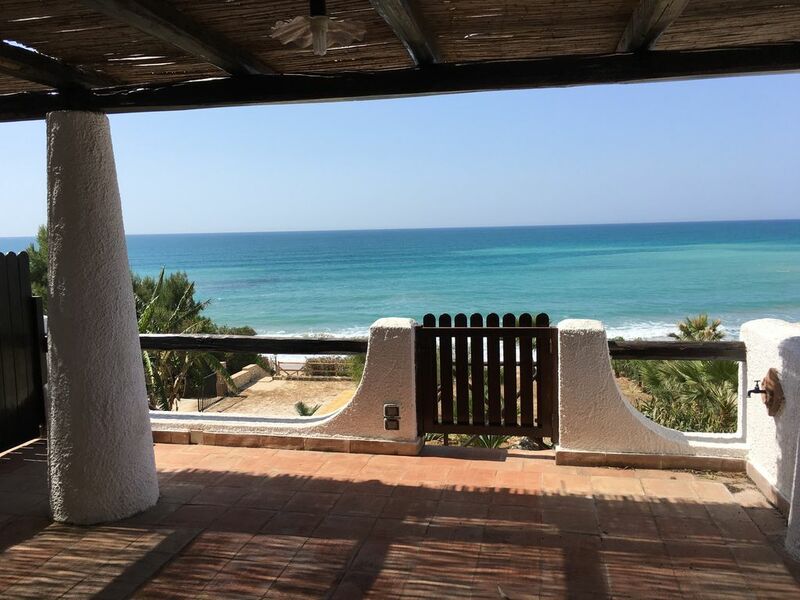 "The location of the apartment is GREAT and could not be better: it''s the first house looking from the beach side with the terrace overlooking the sea. We have been walking along the beach a lot and didn''t found a single house that would be located better. There are houses that are slightly closer to the beach, but without such great sea view. Just check the coordinates (37.497814,13.149037) with Google Maps and you will understand. All the rest: pictures speak for themselves - have a look and you will realize that this is an apartment you have been trying to find :-). Have a nice stay. Piotr"
Petit appartement ("Sole") se situe entre 2 logement de vacances (dont 1 est utilisé en résidence secondaire par le propriétaire) simple mais idéal pour famille avec max 2 enfants (chambre enfants plutôt petite et lit superposé). Magnifique terrasse. Daniele, le propriétaire nous a gentiment mis à disposition un lit bébé et des barrières sur la terrasse mais l'équipement (absence de micro-onde et de chaise enfant) est plutôt adéquat pour des familles avec enfants en âge scolaire (ou sans enfants). L'appartement ne dispose pas de canapé mais il y a des chaises longues sur la terrasse. La localisation est le point fort: endroit calme, facile d'accès en voiture et vue à 180 degrés sur la mer, accès à la plage à 30m (en contrebas du "parking" privé). La plage est quasi "privative"; parfois nous étions seuls (début septembre). Pas d'accès aux commerces à pieds ou transports publics. Dans notre cas le propriétaire était discret mais agréable et arrangeant. sehr schöne Wohnung mit toller Terasse in ruhiger, wunderschöner Lage mit Blick aufs Meer. Nur 100 Meter bis zum schönen Sandstrand. L'ajout d'un micro ondes serait bienvenue. La mise à disposition de ventilateur permettrait de A défaut de climatisation, la mise à disposition de ventilateurs permettrait de rafraichir la maison. Arrival from Palermo or Trapani airport = follow the SS 115 towards Agrigento, near the 125 km take the exit on the right exit Timpi Russi / lumia, turn left towards Lumia / San Giorgio, proceed forward for 2 km and turn right into via Lampedusa.